It's true that bees have stingers (and occasionally use them, of course), but let's not forget: they're also the ones responsible for making our honey. Your tea, corn bread, biscuits, Cheerios, and literally a bazillion different types of candy just wouldn't be quite the same without them. Heck, the whole world wouldn't be the same without these crucial pollinators. No one will have any trouble remembering that when they see your little bee in this adorable outfit. Dressed up in the Child Honey Bee Costume, they'll be able to help the entire world realize that bees are easily nature's most important bug! The polyester tunic has the classic bumblebee pattern: black on yellow stripes, and the wings comes attached, too (because your bee's going to need to get around somehow). And though we've established that stingers are maybe a little bit of downside to nature's all-important honey producers, this suit not only includes one (also attached), but also manages to make the whole concept of a stinger absolutely adorable. Not an easy task, but the suit... with your kid's help... pulls it off. Last but not least, the black headpiece includes that finishing touch to any bee getup -- a pair of soft antennae. 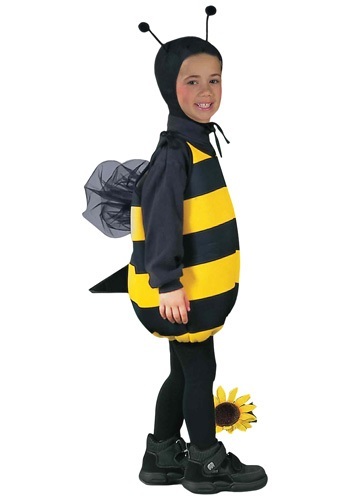 It's the perfect costume idea for your little dollop of honey, and it goes great with a pair of kids' bumblebee tights -- which we happen to sell! However you decide to do it, make this a sweet Halloween for you and your kid with the Child Honey Bee Costume!